State Department announces US leaving UN body responsible for series of anti-Israel resolutions negating Jewish connection to Jerusalem. JTA - The United States has decided to withdraw from the United Nations Educational, Scientific and Cultural Organization (UNESCO) over its anti-Israel bias and need for reform, the Department of State announced. The decision, which would become effective only in 2019, “was not taken lightly, and reflects US concerns with mounting arrears at UNESCO,” read the statement Thursday by the Department of State, in which the United States announced that it had notified UNESCO Director-General Irina Bokova of its decision. The Paris-based body delighted the Palestinian Authority in July when it declared the Old City of Hevron in Judea as an endangered world heritage site. Israeli Prime Minister Binyamin Netanyahu complained that the language of that resolution did not acknowledge the religious attachment of Jews to Hevron, a city which once served as the capital of the biblical Jewish kingdom of Judea and where the tomb of the patriarchs is located. 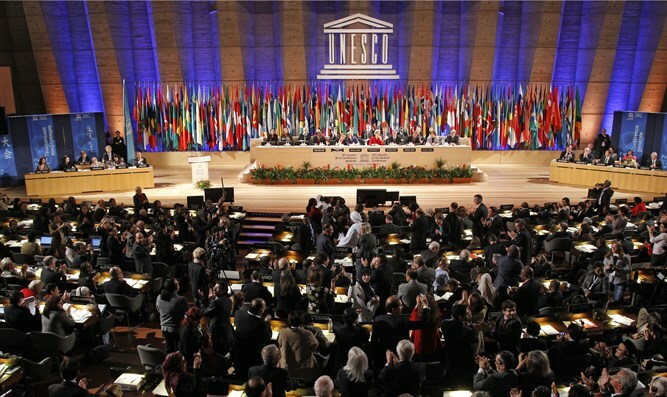 Prior to that resolution UNESCO also passed several resolutions ignoring Jewish ties to Jerusalem, drawing Israeli officials’ fury and criticism by Western countries – including by France, which supported the resolutions during votes. Israel has reduced its funding for UN projects following those votes. Six years ago, the United States cut off more than $80 million a year, about 22 percent of its entire budget for UNESCO, in reprisal for its acceptance of the Palestinian Authority as a member, Foreign Policy reported. The Obama administration said it had to cut funds because a 1990s-era law prohibits U.S. funding for any U.N. agencies recognizing Palestine as a state. Israel also suspended its funding for UNESCO. As a result of US funding cuts, US arrears in membership fees have been swelling each year, surpassing $500 million that’s owed to UNESCO, according to Foreign Policy. The decision to withdraw from UNESCO owes partly to Secretary of State Rex Tillerson’s desire to stop the growing debt. The Reagan Administration decided to withdraw from the organization in 1984, at the height of the Cold War, citing corruption and what it considered an ideological tilt towards the Soviet Union against the West. President George W. Bush rejoined the organization in 2002, claiming it had gotten its books in order and expunged some of its most virulent anti-Western and anti-Israel biases.